Fast & Friendly service guaranteed! The model was originally built in 2012. 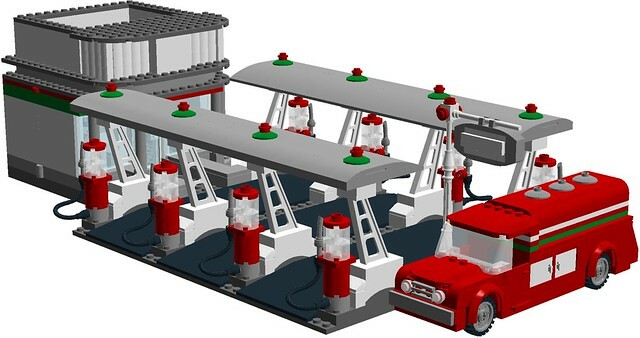 It was modeled after the 2011 CARS set 8487, (Flo's V8 Cafe) but made larger and without the launcher and car wash. I recently changed the color scheme to OCTAN colors, (red white & green) plus I added a truck of unknown origin from 2014 (I think my brother may originally have built it.) I'm not 100% sure where it came from as it's been on my computer for so long. This gas station has eight retro-style stand-up pumps, and three lanes for cars to sit while pumping gas. As a side note, this part should go where the 2 x 4 x 3 brick is above the door while two of these 1 x 4 tiles should go on the stand-up sign. The model's rear swings open to reveal the the clock, four-flavor soda fountain, and the attendant's desk. Their is also a storage area under the soda fountain. The back of the model features a rear exit. I think my brother may originally have built this truck, but I'm not 100% sure where it came from as it's been on my computer for about three years. The driver's doors open, and so do all four storage compartments. 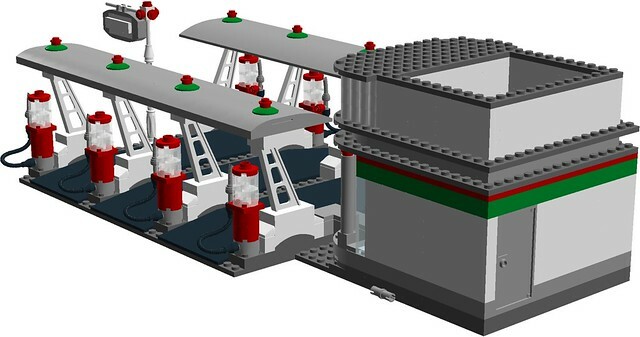 The complete LDD file is available here, if you want it. Remember: Comments, Question & Complaints are always welcome! 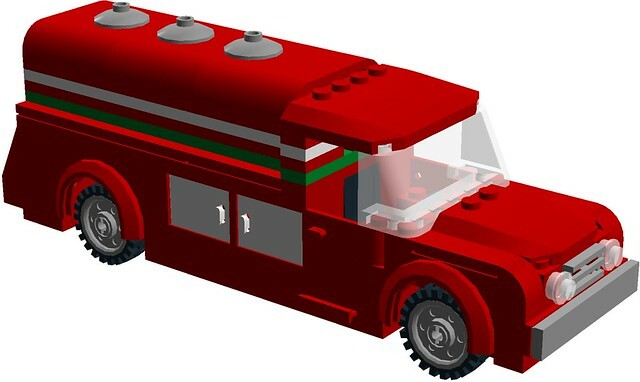 EDIT 1/9/17: added new pictures and an updated ldd file with tanker truck. 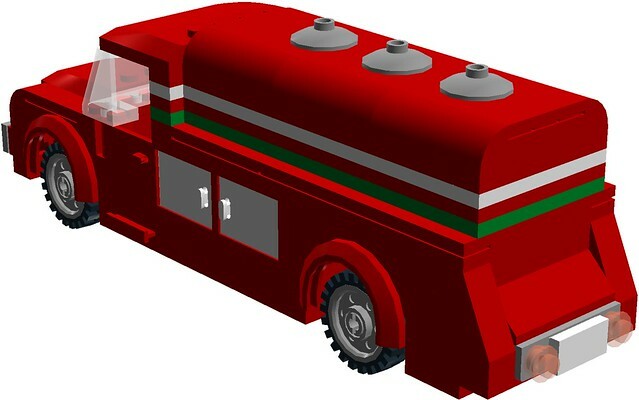 I have updated the main post with new pictures and an updated ldd file with tanker truck. I hope everybody likes the new OCTAN color scheme! 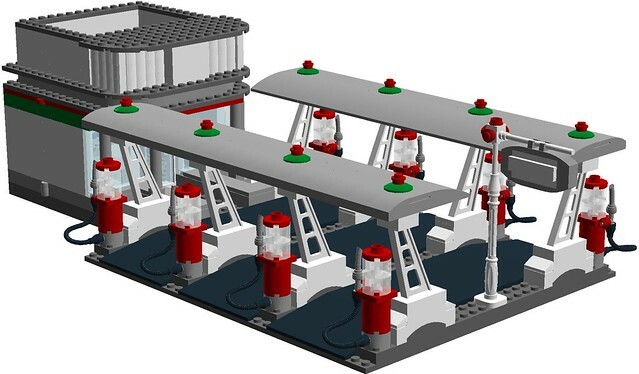 Definitely all has a 50's vibe to it, would love to see how it looks in real bricks. I think part of what is throwing me off in the renders is that it looks like it is mostly in light gray instead of white. The truck looks really nice also. The one thing that might prove an issue is that cars of that era were quite sizeable and I'm not sure the pumps are far enough apart. But you've done a great job capturing the feeling!